If you find yourself without hot water and you are in need of someone to come to your home or business and take a look at it, we have a great team of professionals in place that can quickly identify your problem and of course repair it where possible. Our philosophy at Total Trans4mation is to always treat people in the same manner that we prefer to be treated, which means recommending a repair instead of a replacement if we feel that a repair is going to save you the most money. None of our trained professionals work on commission and they are not trained or encouraged to "sell" but rather to repair your existing water heater in the event it stops working. There are many companies in our industry that incentivize and pressure their plumbers to sell you new appliances as opposed to replacing them which helps to increase their overall sales and revenue, but it happens at your expense. We like to think of our company as one of the good guys who really try to earn your trust as opposed to staring at your wallet. If you find yourself in need of a water heater repair, you can contact us anytime by simply calling 615-900-6873. Total Trans4mation Heating and Air Conditioning Inc is a fully licensed master mechanical contractor that can install various types and sizes of gas and electric water heaters. Over the years, we have installed countless amounts of water heater brands and styles such as the conventional tank-style water heaters as well as the increasingly popular tankless water heaters. At Total Trans4mation, we know a thing or two about which brands are reliable, which types of water heaters are efficient and most importantly, how to properly size and install them. 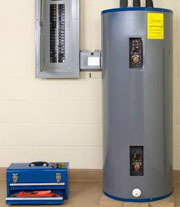 We can either install a conventional water heater with standard efficiency to help you keep your cost down, or we can take a step up in efficiency by installing a well-insulated Rheem Marathon which is guaranteed never to leak because of it's unique fiberglass shell, or we can install an extremely efficient tankless water heater such as the Rinnai tankless water heater that only uses energy when you need it. Whatever your water heater needs may be, we have the products and the professional team to get the job done right the first time. If you find yourself in need of a new water heater, feel free to call us during the day to schedule a free estimate at 615-900-6873.